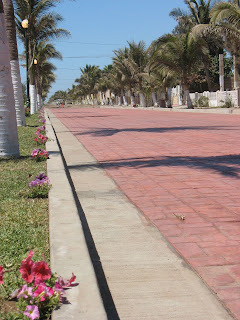 Las Glorias, Sinaloa, is a small, beachfront community located about a kilometer (half a mile) west of Boca del Rio and about 30 miles southwest of Guasave. Situated directly on the Sea of Cortez, it is primarily a resort community. Only about 13 families live in the village year round, but the population swells to more than 100,000 during the week of semana santa (Holy Week). Weekends are busy from November until May with several hundred visitors coming in every weekend from all over the world. RV caravans traveling from northern Canada to points south like Mazatlan and Puerta Vallarta weekend here en route to more "touristy" destinations. Folks from all over Mexico come to enjoy the wide-open, sandy beaches and fresh seafood of Las Glorias and Boca del Rio. Mr. Moro’s Hotel and RV Park is the only year-round hotel and restaurant in the area, but several other seasonal restaurants are scattered along the shoreline. The whole village has electricity, water and the availability of telephone service. Cell phone service and dial-up internet are readily available, too. Mr. Moro’s hotel at the west end of town has recently added wireless internet. We know that soon DSL will reach us! For now, though, Las Glorias remains a pleasant reminder of years past. Locals gather at the convenience store to chit-chat and swap “news”. Phone and electric bills are hand-delivered to residents or are picked up at the community store. Neighbors spend time sitting in the shade, talking and enjoying a fresh-squeezed limeade, while a local rancher herds his cows down main street. 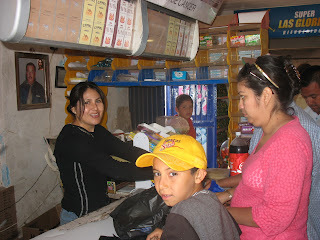 There is a very strong sense of community in Las Glorias. Most of the families are related either by blood or by marriage, and so are protective of each other, but they are also very ready to take new residents in and count them as part of the family. The Association of Neighbors meets monthly to discuss issues which concern the residents – and to eat carne asada (the Mexican version of the backyard BBQ). Local police patrol the streets regularly and are ready and eager to help with anything from a flat tire to a lost tourist! Read more about Las Glorias over at Rebecca's blog, Beautiful Feet! Gracias por ponernos al tanto de Uds. Dios los siga guardando y bendiciendo los planes que hay y buen regreso. Un abrazo de todos aquí en casa.